Congresswoman Alexandria Ocasio-Cortez hates bad reviews. When people comment on her negatively, AOC quickly goes after them. And Gallup issued bad news. AOC’s favorability dropped significantly over the past few weeks. Apparently, the drop concerns her, as up to now she’s been received by Democrats as “the belle of the ball”. DNC Chairman Tom Perez called AOC “the future of the Democratic Party”. And he’s correct, when you consider her trajectory. Post-Green New Deal, AOC’s future looks dim. Her favorable to unfavorable rating was almost even at 24% and 26% respectively in September. However, the gap has grown from 2 percent to over a 10 percent gap in the wrong direction. Currently AOC’s ratings stand at 31 percent and 41 percent respectively. So while she grew her favorability by 7 percent, her unfavorability grew more than double that, specifically 15 percent. Only Democrats views AOC favorably charting 56 percent. But the congresswoman is viewed negatively by most 73 percent of Republicans. In September that number was 56 percent. But Ocasio-Cortez did not take well to the news and immediately chose to play the victim. 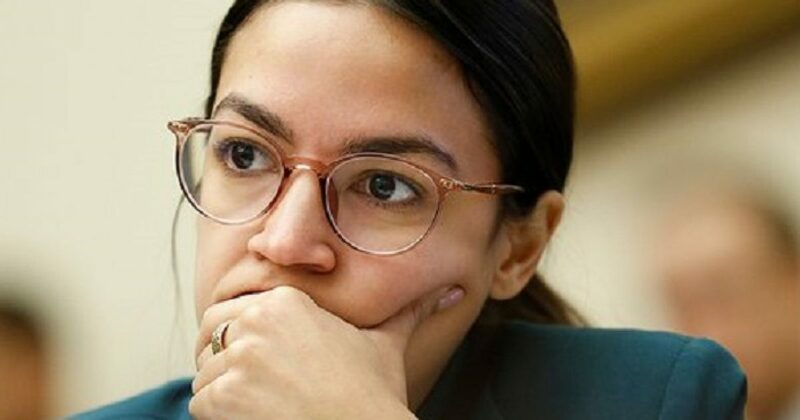 “If you want to know what subconscious bias looks like, it’s a headline saying ‘AOC is underwater with every group EXCEPT women, nonwhites, and 18-34-year-olds,'” Ocasio-Cortez tweeted. The reason people know more is because Fox News has turned into ‘AOC TMZ’ (no offense to TMZ), so awareness is growing w/ GOPers. Bias isn’t Ocasio-Cortez’ problem. Stupidity is. Last month, AOC apologized for being a woman, who- get this- identifies as a woman. Apparently, it’s the kind of privilege we routinely overlook. Shortly thereafter, we got to the bottom of AOC’s bizarre rise to power, when we exposed her as the puppet of the Justice Democrats. Honestly, this actually sets my mind at ease a bit. I kept asking myself how a legislator could possibly call Reagan a racist.Or why this woman thinks student loans and climate change should deter a generation from reproducing. (Although, if it keeps her from reproducing, I’m all for believing in climate change.) Even dumber, AOC apologized for being a woman who identifies as a WOMAN! Because identifying with the appropriate gender is a form of privilege most people just cannot understand. If I had to make a guess, I’d say AOC’s falling approval ratings are linked to her exposure as a fraud. In the age of Donald Trump, Americans realize they need not settle for anyone lacking authenticity. Someone get me the Vegas odds, because I’m willing to bet AOC’s first term doubles as her last.